The need for revision hallux valgus surgery is a problem all surgeons encounter. Revision of a failed hallux valgus surgery is often difficult, and very little research exists and few papers have been presented on the topic. Hallux valgus failure has multiple causes, including reoccurrence, avascular necrosis, malunion, nonunion, and hallux varus. These problems can be difficult to address, although some are far more difficult to correct than others. This article details the underlying causes of hallux valgus failure, the workup, and the revision options, with the hope of providing greater education and research on this difficult problem. Hallux valgus failure has a multitude of causes. Too many potential causes exist to be discussed completely in this article, but the most common causes are addressed. Recurrence of hallux valgus after surgical correction is undoubtedly a frustrating scenario for both patient and surgeon. Austin and colleagues1 found a 10% recurrence rate on retrospective review of 300 Chevron osteotomies performed. A common theme among all recurrence was a preoperative hallux abductus angle greater than 35°, and an intermetatarsal angle of greater than 15°. Lagaay and colleagues described a 5.56% reoperation rate in a retrospective analysis of Chevron osteotomies, with recurrence being the most common reason for return to the operating room. Many causes of recurrent hallux valgus deformity have been described, most of which involve inadequate patient selection and inadequate procedure selection, which can be catastrophic to the overall outcome for the patient. For example, performing a head osteotomy in a patient with a severe intermetatarsal angle may not afford proper correction. Even if soft tissue rebalancing with aggressive capsular reefing gives the impression of adequate correction, the risk of deformity return is high. Additionally, failure to recognize the need for supplementary procedures, such as an Akin, may lead to continued lateral deviation of the hallux with abnormal pull of the tendons about the first metatarsophalangeal joint. Inappropriate intraoperative technique is also a common cause of reoccurring hallux valgus. More specifically, insufficient lateral release with poor sesamoid realignment, improper repair of the medial capsule, inadequate repair of the intermetatarsal angle, or a deficiency in hardware fixation all may lead to deformity recurrence. In addition, failure to address a hypermobile first ray can lead to an unfavorable outcome for patients with persistence of symptoms. Other causes that are less under surgeon control have also been described. For example, Okuda and colleagues4 found that a more roundly shaped metatarsal head was more predisposed to postoperative hallux valgus recurrence when compared with a more angular metatarsal head. Through identifying this in the preoperative planning process, the surgeon can modify the procedure accordingly to prevent return of the bunion. Procedures for revisional surgery can be divided into joint-sparing and joint-destructive procedures. If the deformity is still mild to moderate in nature and no severe arthritic changes are present, a joint-sparing procedure may still be an option. The surgeon may consider another osteotomy either distally or proximally, a double osteotomy, or a Lapidus bunionectomy. In any case, capsulotendon rebalancing will most likely also be needed around the first metatarsophalangeal joint. Good results have been found with the use of a scarf osteotomy for revisional bunion surgery. One study demonstrated a mean American Orthopaedic Foot & Ankle Society (AOFAS) score improvement from 59 to 90, with a mean reduction in intermetatarsal angle from 13° to 4° Reoperation with a crescentic osteotomy has also been illustrated in the literature with good long-term outcomes Lim and Huntley describe a 39-year-old woman previously treated with a Chevron osteotomy who presented with recurrence of her hallux valgus deformity. A proximal opening wedge was performed in combination with a short distal scarf osteotomy in which a medial closing wedge was used. Her 3-month postoperative visit showed both adequate clinical and radiographic outcomes. The Lapidus arthrodesis is a reliable and reproducible procedure that is often used in secondary surgery for hallux valgus correction, especially if a significant amount of distal work has already been performed. The Lapidus procedure is a valid alternative if a severe intermetatarsal angle exists and first metatarsophalangeal joint salvage is desired. The procedure will also address any underlying hypermobility that may have been overlooked initially, and will provide overall stability to the medial column. Ellington and colleagues performed a retrospective review of 32 feet treated with a Lapidus arthrodesis for recurrent hallux valgus with 1-year follow-up. 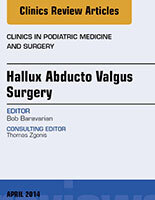 The mean hallux valgus angle decreased from 36.2° preoperatively to 15.3° postoperatively. The intermetatarsal angle also improved significantly from 13.6° to 7.5°, and 87% of patients reported good to excellent results. Coetzee and colleagues also recommend the Lapidus as the preferred procedure for salvage of failed hallux valgus surgery. They conducted a prospective cohort study of 26 feet with previously failed procedures. At 2 years, the mean AOFAS score had increased from 47.6 to 87.9 points. The mean intermetatarsal angle decreased from 18.0° to 8.6°. Both the Keller arthroplasty and first metatarsophalangeal joint fusion may be preferred procedures for secondary hallux valgus operations. Kitaoka and colleague compared these procedures after failed hallux valgus surgery. Keller arthroplasty was performed on 11 feet, and first metatarsophalangeal joint fusion was performed on 9 feet. The mean age of each group was 63 years. In the resection arthroplasty group, the hallux valgus angle improved an average of 11°, whereas the intermetatarsal angle showed an improvement of 2°. In comparison, the arthrodesis subset showed a decrease in hallux valgus angle of 23° with an average 2° improvement in intermetatarsal angle. Results were good in 6 of the 11 feet in the arthroplasty group (54.5%) versus 6 of the 9 feet (67.0%) in the fusion group. The outcome of the joint-destructive procedure truly depends on proper patient selection. Younger, more active patients will have a more favorable result with an arthrodesis procedure. On the contrary, older and more sedentary patients may obtain adequate results with less healing and recovery time if a Keller arthroplasty is performed. At University Foot & Ankle Institute, the most common finding for reoccurrence is either an undercorrected intermetatarsal angle or hypermobility of the first ray. In most cases, a Lapidus procedure with or without bone graft is undertaken rather than a reosteotomy. The authors have found that the Lapidus procedure allows proper alignment of the first ray in multiple planes and also allows for correction of length and possible hypermobility issues. Care should be taken when performing a second osteotomy on the first metatarsal because of an increased risk of nonunion, avascular necrosis, and scar formation. Finally, if a McBride-type bunionectomy was performed initially with no osteotomy, a Lapidus or proper osteotomy may be considered to correct the underlying problems. One of the most common causes of failure is malunion. The most common type of malunion is caused by iatrogenic plantarflexion or dorsiflexion of the first metatarsal. This deformity may occur at surgery or may be a postoperative complication from early unendorsed weight-bearing by the patient. Most plantarflexion cases are iatrogenic and must be addressed at the time of surgery. Mild plantarflexion of the first ray is often desired to compensate for the mild shortening associated with first metatarsal osteotomies. However, if the fist metatarsal is too plantarflexed compared with its normal position, sesamoid pain and capsular inflammation about the first metatarsophalangeal joint may be noted. Care should be taken to check the position of the first ray before fixation on a lateral fluoroscopic image. If the osteotomy places the ray very plantar, the osteotomy should be dorsally displaced. If plantarflexion is noted after surgery, a cushioned shoe or an orthotic with a cutout under the first metatarsal may be helpful. If the region is still painful, a dorsiflexion osteotomy of the first ray may be necessary. More common than plantarflexion of the first ray is elevation. An elevated first ray is commonly symptomatic and results in transfer lesions under the second metatarsal head, lateral column overload from the forefoot varus position, and possible midfoot arthritis of the lesser rays. Dorsiflexion problems may be iatrogenic or related to patient noncompliance. During surgery, the position of the first ray must be checked to ensure the metatarsal is not elevated. Well-designed osteotomies and rigid, stable internal fixation are essential in avoiding dorsiflexion of the first ray during the postoperative period. V-shaped osteotomies tend to be more stable and are therefore able to resist loading stress well compared with less-stable wedge osteotomies. Care should be taken to avoid early weight-bearing, especially in patients in whom risk of dorsiflexion with increased plantar pressure is high. Should dorsal malunion of the first ray occur, an orthotic with a medial forefoot posting can help increase pressure under the first metatarsal region and improve pressure distribution. If this is not successful, plantarflexion of the first metatarsal either with osteotomy or with a Lapidus-type procedure, with or without bone grafting, can be helpful. Hallux varus is another frequent problem related to hallux valgus correction. The main causes of hallux varus are iatrogenic and can occur with bunion correction, even in the best of surgical cases. One retrospective study found 4 resulting instances of iatrogenic hallux varus out of 270 Chevron bunionectomies performed, all of which required surgical intervention. A common cause of varus deformity is overstacking of the medial eminence. This circumstance can be avoided by leaving the medial sesamoid groove intact. Overly aggressive closure of the intermetatarsal angle below zero can also cause hallux varus. The position of the first ray and distal osteotomy should be checked before final position fixation. If the alignment is not correct, adjustments at the time of surgery to the intermetatarsal angle should be made before final fixation. One of the most common causes of hallux varus is overtightening of the capsule medially. This condition results in a medial overhang of the tibial sesamoid, which can result in hallux varus. Finally, an aggressive lateral release with or without a fibular sesamoid removal results in poor tendon and ligament balance about the great toe joint, leading to varus formation. In all cases, proper intraoperative vigilance can help prevent a subsequent varus. Proper ray positioning, limited lateral release, and proper capsular balancing are essential surgical factors in avoiding hallux varus complications. Of interest with respect to different osteotomy options for hallux valgus correction is the possibility that some osteotomies have a higher risk of developing a varus than others. Although no research is available on the potential causes of hallux varus due to an opening wedge osteotomy, the authors believe that through lengthening the first metatarsal at an angle, the flexor tendon complex is put on stretch medially, resulting in an increased risk of hallux varus. Special attention should be given to the proper positioning of the first metatarsal in an opening wedge procedure to avoid overlengthening and possible risk of hallux varus. Should a hallux varus complication occur, multiple options are available for correction. The most simple corrective action is strapping of the region. In some patients, strapping of the great toe to the lateral fifth metatarsal region is sufficient to relieve pain. Should surgery be necessary, a soft tissue release rarely works but can be attempted as a first-line option during surgery. Plovanich and colleagues conducted a systematic review to assess the integrity of soft tissue reconstruction for flexible iatrogenic hallux varus repair. They found a 16.2% complication rate among all procedures. Transfer of the extensor hallucis longus tendon with fusion of the hallux interphalangeal joint was the only procedure to result in recurrence of the hallux varus with a rate of 4.4%. The other procedures performed included transfers of the abductor hallucis tendon, the first dorsal interosseous tendon, and the extensor hallucis brevis tendon. A tightrope procedure or internal brace technique for reefing of the lateral capsule and ligament structures can help reposition the ray. If the first intermetatarsal angle is dramatically overcorrected, a reverse medially shifting head osteotomy can realign the sesamoid complex and assist in hallux varus correction. One study found positive outcomes in varus correction with a reverse scarf osteotomy combined with opening wedge of the proximal phalanx after scarf/Akin osteotomies in a small subset of patients. Others have suggested a reverse distal chevron osteotomy for cases in which the intermetatarsal angle has been overcorrected. Often the authors will obtain patient consent for several procedures when hallux varus correction is planned. This practice allows each step to be systematically performed during surgery until great toe alignment is rectus. This procedure includes a soft tissue release, capsular release, ligament reefing, and possible metatarsal osteotomy. A fusion of the great toe joint is usually previously planned and not part of the systematic procedure. If the ray is rigidly positioned medially and/or arthritis of the first ray has occurred, a fusion of the first metatarsophalangeal joint can be the best option. Grimes and Coughlin studied the results of first metatarsophalangeal joint fusion after failed surgical correction of hallux valgus and found satisfactory outcomes, including in patients who presented with iatrogenic hallux varus. Other investigators have also recommended fusion for failed hallux valgus surgery, because the influences around the first metatarsophalangeal joint may be unpredictable after an already unsuccessful procedure. First metatarsophalangeal joint arthrodesis assures permanent stability across the joint with little risk of subsequent deformity. Iatrogenic shortening of the first metatarsal from osteotomy is yet another possible complication associated with hallux valgus surgery. The main causes of shortening are a poorly planned surgical procedure, a poorly performed metatarsal osteotomy, or possible shortening of the first metatarsal postoperatively because of poor bone quality or fixation failure. Poor surgical planning most often results from performing the wrong procedure on an already short first metatarsal. If a short first metatarsal is present, a closing base wedge–type procedure or a Lapidus-type procedure with bone wedge cuts may result in excessive shortening. Potential alternatives include an opening base wedge osteotomy or a Lapidus with joint curettage with or without bone grafting. The use of the proper procedure based on the needs and requirements of each individual patient is essential for adequate outcome prediction. Iatrogenic intraoperative shortening of the first metatarsal may also occur because of the osteotomy made. It is essential to consider that a head or base osteotomy should be made, at worst, perpendicular to the long axis of the first metatarsal to avoid shortening. A Kirschner wire (K-wire) can be used as an osteotomy guide and checked under fluoroscopic guidance before performing an osteotomy. In a minimally short first metatarsal, the osteotomy should be made to slightly lengthen the capital fragment relative to the long axis of the first metatarsal, which can help increase pressure on the first ray. Shortening because of bone shift or fixation failure is also a common cause of hallux valgus complication. In an attempt to allow early weight-bearing, some cases may result in failure. The bone quality of each patient must be assessed at the time of surgery. If bone quality is deemed poor, a period of limited or non–weight-bearing can be helpful to avoid shortening of the first metatarsal from compression or bone failure. Furthermore, if fixation is deemed to be poor, a second point of fixation may be added, such as another screw, a plate, K-wire, or an absorbable pin. In the authors’ practice, 2 screws are often placed in distal head osteotomies and 2 screws and a plate are placed on Lapidus bunionectomies to avoid fixation complications. Should shortening occur, a lengthening scarf-type osteotomy or a bone-lengthening with bone graft may be attempted. Bevilacqua and colleague studied the amount of length obtained with a distraction scarf osteotomy in patients for whom previous bunion correction failed. They documented an increase in length of 7.08%, with a statistically significant increase between preoperative and postoperative measurements. They also described using the distraction scarf osteotomy in conjunction with a Lapidus procedure to maintain length of the metatarsal. This adjunct procedure prevented severe shortening in patients who were noted to have an already shortened first metatarsal preoperatively. If the main source of pain is transfer pressure on the lesser metatarsals, especially the second metatarsal, a shortening osteotomy of the lesser metatarsals may be a better option to compensate for the deranged length of the first metatarsal. Conservative options to help with first metatarsal shortening include stiff-soled rocker-style shoes, such as platforms, clogs, or wedges for women, which avoid the roll and push-off phases of gait and decrease forefoot overload. An orthotic with a metatarsal pad and a cutout under the second metatarsal with or without a Morton extension below the first metatarsal can be helpful to decrease pressure under the lesser metatarsals. Nonunions are rare in hallux valgus surgery but can be a devastating problem to handle. Nonunions can be a result of either technical complications by the surgeon or issues related to the patient. Surgeon complication is often related to poor osteotomy or joint preparation and poor fixation. The osteotomy site must be prepared properly, including protection of the periosteum and joint capsule that supply nutrition to the bone. The actual osteotomy or joint resection should be performed with minimal thermal necrosis to avoid loss of vital cells necessary for bone healing. Finally, the area must be properly fixated to avoid movement and allow for bone integration and repair. Movement may cause scar tissue formation, which increases the chance of nonunion. A second and less commonly considered cause of nonunion is patient-related issues, such as nutritional factors and/or poor compliance. These issues must be addressed before surgery to avoid postoperative issues. For example, if nutrition issues or potential bone quality and healing issues are considered a possibility, vitamin and bone density levels may need to be determined before surgery. Vitamins B and D are essential for proper healing. A low bone density level may result in poor bone healing and should be addressed with medication before surgery. Finally, patient compliance with weight-bearing status is critical to healing. Patients must be educated and instructed regarding the essential factors associated with non–weight-bearing and the potential for nonunion. If the unfortunate scenario of a nonunion occurs, nutritional, bone density, and vitamin levels should be checked. Several bone density medications may be helpful in increasing bone healing. A bone scan can also help determine whether the nonunion is active or nonactive. A nonactive nonunion requires surgical care, because the region does not have good blood supply for healing. In these cases, removal of the nonunion, stable fixation, and possible bone grafting in an optimized patient can result in revision fusion. Hamilton and colleagues16 conducted a multicenter retrospective study to evaluate the rate of union after revisional Lapidus for previously failed unions. Of the 17 feet receiving a bone-block Lapidus arthrodesis with autogenous bone grafting, 14 feet demonstrated successful union. Of particular interest, all 3 failed revisions were in patients who were active smokers. A bone stimulator may also be helpful to add to the mix of a nonunion with or without revision surgery. Avascular necrosis is another rare cause of problems related to hallux valgus surgery. Often the problem has an unknown cause, and little is known regarding why it may occur in one person and not another. Several factors must be considered during surgery to avoid avascular necrosis risks. Limiting the amount of periosteal dissection and bone stripping is of primary concern. A thorough understanding of the location and proper protection of the vascular supply to the first ray is also important. Finally, proper internal fixation and stable bone constructs limit the risk of avascular necrosis. One cadaveric study showed that the vascular supply to the metatarsal was better preserved with a long dorsal arm osteotomy versus a Chevron osteotomy, and concluded that the risk for necrosis with the latter is greater. Should avascular necrosis occur, it is usually limited and can be reversed with the use of a bone stimulator. Non–weight-bearing may also help in early cases. If avascular changes progress, bone resection, bone grafting, and fusion may be necessary. If a large amount of resection is required to remove all devitalized bone, a bone block arthrodesis is most likely required to maintain length and avoid transfer metatarsalgia. Failure of hallux valgus surgery is an inevitable occasional outcome for all surgeons and is part of the potential risks of bunion surgery. Dealing with the complications is often laborious and complicated, and experience with revision surgery is essential for proper planning and adequate outcome. To limit the risks associated with hallux valgus complications, proper planning is critical. Appropriate medical workup must be obtained, and the patient must have a solid understanding of the postoperative course. The surgeon must choose a suitable procedure for the associated hallux valgus deformity. The idea of one procedure being ideal for all patients must be abandoned. Hypermobility, ray length, toe position, and cartilage alignment/tracking must be assessed for proper procedure selection. The surgery must be performed with care to protect the vascular and nutritional supply to the surgical site. The first ray must be positioned properly and fixated with adequate stability. Soft tissue balancing also must be addressed before closure of the wounds. After surgery, the foot must be protected properly, through both the surgeon’s instructions and the patient’s protection of the region. With proper planning, optimal surgical care, and patient protection, many of the issues associated with hallux valgus failure can be avoided. The hope is that the information provided in this article will serve as a template and starting point for patient care considerations related to hallux valgus surgery.